Dolomite is a carbonate mineral, widely used in various fields. Dolomite process equipment have crusher, sand making machine and grinding mill. The most common is dolomite grinding mill, it can produce 80-2500 mesh dolomite powder. With the development of modern science and technology, dolomite processing, utilization has penetrated into all fields of social development. It has become great economic value of mineral resources. 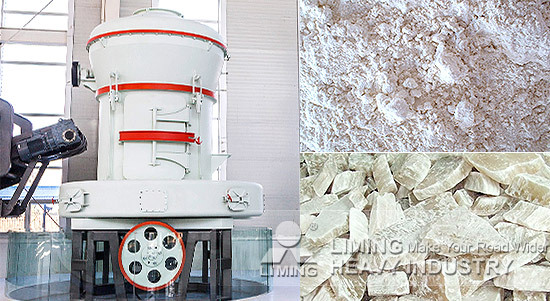 Liming Heavy Industry developed various types of equipment to meet the dolomite fineness requirements of different field. The main grinding mills are 6-40 mesh coarse grinding mill, 80-400 mesh fine grinding mills (LM vertical roller mill, MTW European grinding mill, TGM Super Pressure Trapezium mill) and 400-3250 mesh ultrafine grinding mills (LUM ultrafine vertical mill, MW Series Micro Powder Mill). More dolomite process equipment details, please contact with our online service!